Every year, business is among the top majors of Austin College graduates. Those alumni complete coursework in business law, industrial psychology, finance, accounting, marketing, capital markets, international finance, entrepreneurship, and business management. But they have also had opportunity to do some hands-on exploration—and those adventures leave a significant mark upon the learners. The Williams Student Investment Fund (SIF) was born out of a $1 million contribution in 2007 from Todd Williams ’82, now retired as partner and global co-head of Goldman Sachs’ real estate private equity investment area. His plan for the SIF was to prepare Austin College students for careers in finance by providing real-world experience in the stock market. At some schools, students are making virtual investments. At Austin College, it’s the real deal. As a result of those decisions, the fund has grown and helped to fulfill the other part of Williams’ plan for his original contribution. He expected, in time, that the fund would provide enough interest to cover scholarships for students who would not otherwise be able to attend Austin College. In 2013, a cash withdrawal of $160,000 from the earnings of the SIF established a sponsored scholarship fund that will provide $5,000 per year to four students for four years. The student managers in the class each are responsible for a sector of the market. Equities are divided into these sectors: consumer discretionary, financials, information technology, consumer staples, health care, telecommunications services, energy, industrials, and utilities. 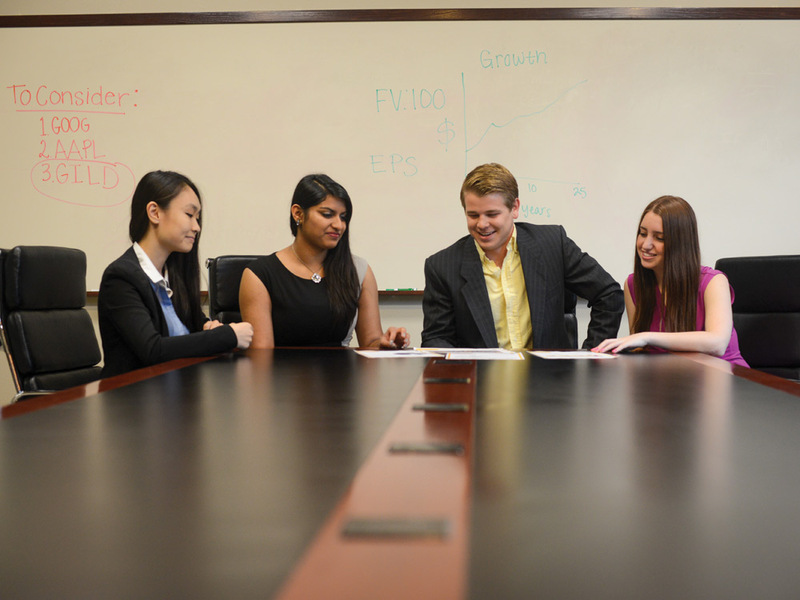 Students research companies and develop presentations for their advisors and peers for investment consideration. They also prepare a mid-year annual report and keep the portfolio balanced overall. The Annual Report is complete with strategy, highlights, data, and information about current holdings, and companies on the watch list. Apache, Caterpillar, eBay, Google, GE, and St. Jude Medical were among the holdings in 2013. The Williams Student Investment Fund is a course that students take for various credits depending upon course level. (A 200-level course is .25 credits; the 400-level course is .75 credits.) Students may take the course up to four terms to earn a maximum of two credits. Most students take the course for two terms—once at 200-level and once at 400-level). Four representatives of the Williams Student Investment Fund attended the 14th R.I.S.E. Conference in Dayton, Ohio, in March, along with students from 130 colleges and universities, representing more than 60 student investment funds. 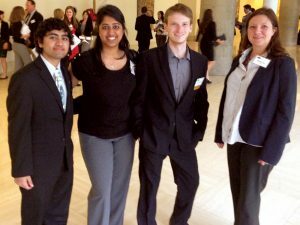 Alicia Mistry ’14, Jackson Ross ’14, Rizwan Gangwani ’16, and Katarina Heidenhofer ’17 represented Austin College and participated in the investment fund competition. The Redefining Investment Strategy Education (R.I.S.E.) Symposium is sponsored jointly by the University of Dayton and the United Nations Global Compact. 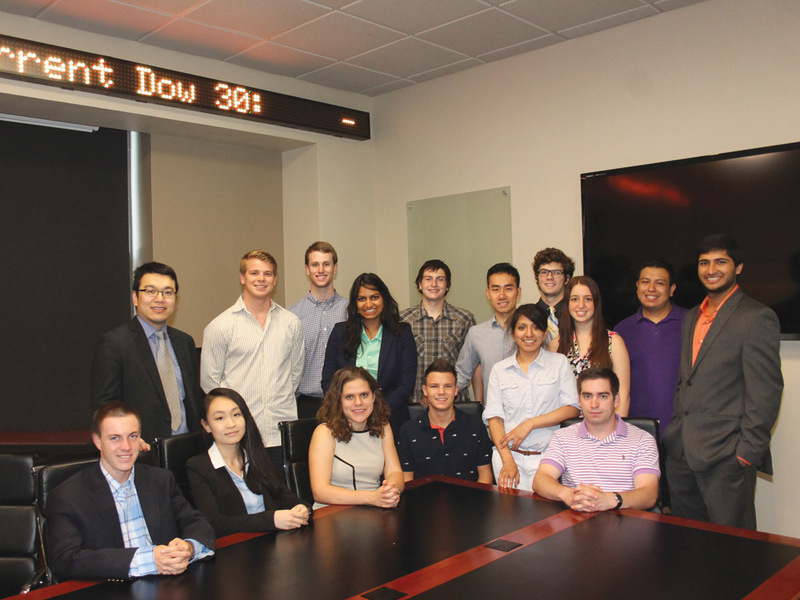 The Austin College fund placed ninth in the Growth Investment-style category. The winner of the category posted a risk-adjusted performance figure of 15.98 for the 2013 calendar year. Austin College’s risk-adjusted return was 11.64. Competition has increased as more schools from around the world participate and overall market performance has improved. In addition to the competition, the conference brings together professionals from the Federal Reserve, Wall Street, corporate America, the financial media, and the international community with a worldwide collection of students and professors. Students attend breakout sessions and lectures on topics such as private equity, fixed income, portfolio management, risk management, and perspectives. Workshops focus on honing skills in security analysis, hedge funds, and portfolio construction. The learning and networking opportunities for future fund managers is invaluable. The economy fluxes with the headlines, the frontlines, the weather, and the folly of man. To effectively develop future professionals for the demands of the ever-changing business environment, Austin College has expanded the Department of Economics and Business Administration with a new major and a new minor. Effective this fall, a major in business finance has been added to the current majors of business administration, economics, and international economics and finance. By mastering the high-demand skills learned in finance, the liberal arts student can be prepared for the expected 39,000 new finance-related jobs in the next 10 years. The median pay in a finance career is $77,000 annually. Austin College students also can now earn a minor in accounting through the department. Job forecasts call for 166,700 new accounting jobs in the next 10 years with a median pay of $63,500 per year. Just for a little while, students walk in the shoes of the underprivileged, underpaid, and under informed—those under the gun to make something from little and call it a life. “Economics of the Working Poor,” the January Term course taught by Kevin Simmons, Corrigan Chair of Business Administration and Economics, challenges students through classroom assignments and hands-on volunteer work to look into the faces of the poorest in the community—and, albeit just on paper, to live their lives. Using Barbara Ehrenreich’s book Nickel and Dimed: On (Not) Getting By in America, Simmons first exposes students to the trials of poverty through the text. Ehrenreich documents her experience of leaving her regular job to work for minimum wage and trying to support herself. She writes about real people and the high cost of being poor. The class is divided into groups that are assigned scenarios such as single mom, with two children, working for minimum wage; elderly couple with Medicare, Social Security, and a small savings account; married couple, two minimum-wage jobs, no health insurance, and baby on the way. Then the new “families” must draw up a workable budget. After presenting those budgets to the class, Simmons throws a curve ball. Or, one might say, life happens. Single mom loses her job. Elderly couple is scammed out of their savings. Dad’s car blows a gasket. So, it’s back to the balance sheet and the relief for students that this is only an exercise. Still, they make their own phone calls to the Department of Human Services, drive the neighborhoods looking for a place to live, and price reliable cars or bus fare. The students learn pretty quickly that Wi-Fi and cable aren’t actually necessities. The groups also are assigned topics to research and present to the class. They study unemployment, minimum wage, living wages, health insurance, and education. These policies and accompanying math gain significance alongside the budget project. “This makes them better citizens,” Simmons said. 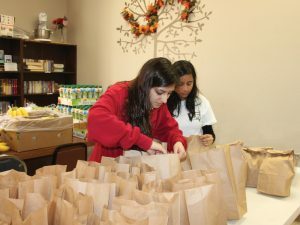 “They can see what’s often unseen in most communities.” And, each afternoon during January, students in the course roll up their sleeves and volunteer at an approved agency that serves the underprivileged, such as the Crisis Center, food pantry, Grayson County Homeless Shelter, and Sherman Senior Citizen Center. Chris Melton ’16 spent his time with the senior set, serving as a technical support volunteer. “One thing that stands out to me about the experience is helping a man find a Geocities-esque website about the town on Long Island where he grew up,” Melton said. “He seemed fascinated that something like that was available.” Melton also delivered Meals on Wheels and met a client who was proud to tell that he was a Korean war veteran and an Austin College alumnus. “I would recommend this class to economics majors because economists need to think outside their personal experiences and see how policies can affect others,” Melton said. The JanTerm class “Economics of the Working Poor” is offered every two years and will be an option in 2015. Austin College faculty member Melanie Fox helped create the ESP Conference to provide opportunities for undergraduate economics students to present research. 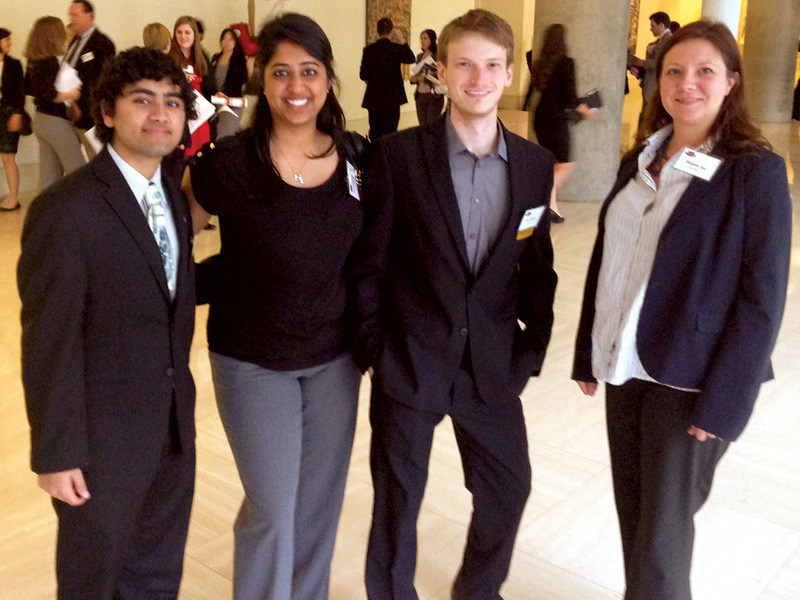 Austin College participants at the 2014 conference include Aditya Misra, Varshini Kalyan, and Evan Harper. Each spring, Austin College co-sponsors the Economics Scholars Program (ESP) for Undergraduate Research along with the Federal Reserve Bank of Dallas. ESP features student-initiated or student-faculty co-authored works that bring to light new information in economics. Since 2007, the program has grown from 23 participants to, in 2014, a gathering of 190 participants representing 27 schools across 16 states. Economics undergraduates in the program develop skills sometimes thought to be reserved for other disciplines or graduate-level scholars. “This is not research that simply restates something that’s already discovered,” said Melanie Fox, associate professor of economics and the Jack B. Morris Professor of Economic Policy at Austin College. To qualify for presentation at ESP, the research must reveal fresh information. “Students can find something new by extending a test in a new way, conducting a new test of an old idea or using the same idea in a different situation, or developing something completely original,” Fox said. The research projects are not class requirements, so the motivation to do the hard work often comes from a driving need to know. “Some students just want to explore more or answer a question until they’re fully satisfied,” Fox said. Students who pursue this opportunity are often likely to participate later in master’s- or PhD-level programs. This year, papers covered economic issues including finance, agriculture and development, health, labor, international, public, labor and preferences, education, labor and sports, macroeconomics, environmental/commodities, and finance. All papers initially are submitted to the ESP Peer Review Board. In 2014, the board chose the best 34 for formal presentation, in addition to 12 poster presentations in an informal setting. Austin College seniors Varshini Kalyan and Evan Harper were members of the 2014 Peer Review Board. Harper also was a presenter. The conference initiates students into varying levels of responsibility, such as acting as a discussant or session chair. The benefits are abundant. Fox said the project hones problem-solving skills and deepens students’ understanding. They benefit greatly by learning how math leads to policy and why policy matters.